Rogue Audio Cronus Magnum II review | What Hi-Fi? We’re disappointed. A name like Cronus Magnum should be attached to some demented super-villain in the Marvel Universe rather than an amplifier. But get past the grand moniker and you’ll find there’s a lot to like about this generously specified valve amp. Rogue Audio is based in Pennsylvania, USA, and all its products are built on site rather than sub-contracted out to a Far Eastern OEM manufacturer. That's unusual in today’s market, particularly when it comes to the more affordable end of the valve amplifier market. And yes, £2500 is very much entry-level for an amplifier that delivers what is (in valve terms) a generous 100 watts-per-channel output. The design of this amp has carefully evolved over the past decade or so. The power output has almost doubled over that time thanks to a change of output valves and upgrades to the power supply. The audio circuit has improved too, with revised components and circuit refinements to improve transparency and detail. Take the Cronus Magnum II out of its box – careful now, it weighs a hefty 25kg thanks to the combination of a hefty mains transformer and the pair of output transformers – and it’s like stepping back 30 years. The Cronus’s appearance is as traditional as they come, with functional casing crowned with an array of exposed valves. An optional cover is available for those with safety concerns. The four output valves – the large ones at the back – are the currently fashionable KT120s rather than the EL34s of the original design, and they need to be installed. Don’t worry - it’s a simple process. Each valve is clearly marked and fitting it is simply a matter of aligning the pins on the valve base with that of the relevant socket and pushing it in. The pin design means that they can’t be installed incorrectly. Just make sure they’re seated properly before you power up the amp, though. The smaller, preamp valves are pre-fitted, so there’s nothing to worry about here. Our Cronus Magnum II has a nicely finished silver front fascia, but black is also available. The rest of its chassis is covered in a crackled black paint more usually seen on dedicated pro-orientated kit. In the pro world, aesthetic considerations tend to take a back seat to functionality. You’d have to go back to the 1980s to find a time when such a finish was common on domestic gear. We’re a little surprised to find a remote - it seems even the most traditional of products can’t ignore this modern convenience. We like the handset’s simplicity: there are just three buttons – two for volume and the third for mute – but the remote’s cheap, plasticky feel would embarrass a pair of budget wireless speakers, let alone a serious hi-fi product of this type. Put the cheapo remote and the choice of paint finish aside, and the Rogue is a well-made unit. Its chassis feels reassuringly solid, and it’s neatly put together. This feels like a product built to last decades, with chunky control dials that work with precision alongside satisfyingly solid buttons. The Cronus is a well-specified unit. There are three line-level inputs, a moving magnet phono stage and even a headphone output - the last not being common on valve amplifiers. It also has preamp outputs in case you want to add a power amp or connect a subwoofer. See that meter on the top panel? It’s there to help set the bias currents for the quartet of output valves. Bias is the kind of thing we’d check on initial installation (after waiting about 30 minutes for the circuit to fully stabilise) and then every couple of months after. Rogue has made the process easy. Remove the small panel at the top – it’s secured with two bolts – and you’ll find the adjuster screws for each valve next to the toggles that switch them into circuit. The company even provides the screwdriver for the job and has made a specific place on the amp to store it. Thoughtful. Once it is up and running, we think the Cronus Magnum II is a terrific unit. We use our usual combination of Naim NDS/555PS music streamer and Clearaudio Innovation Wood record player. Speakers, usually something that has to be chosen with care with traditional valve designs, proved no problem with the Rogue sounding as at home with our reference ATC SCM50s as it did a pair of highly efficient Audio Note AN-Js. Regardless of partnering kit this amp sounds big and powerful in a way that's alien to most similarly priced valve amps. There’s plenty of authority, and that works well with large-scale dynamic pieces of music such as Holst’s Mars. Here the Rogue delivers a muscular sound with wide ranging dynamics and plenty of punch. It’s not afraid of the seismic crescendos in this piece, and renders them with solidity and composure. This amplifier goes loud too. Listen to it in full flow and that claimed 100W-per-channel figure is entirely believable. Stereo imaging is good. While not delivering the most expansive or precise sound stage we’ve heard, the Rogue layers the presentation well, and remains stable even when pushed. Many alternatives lose this ability to organise when things become demanding. Those expecting the stereotypical soft and warm valve amp presentation aren’t going to be totally happy though. While pleasingly subtle, and capable of good insight, the Rogue only sounds nice when the music demands. It doesn’t overtly sanitise the music - and for us that’s a good thing. The Rogue’s tonality is nicely judged. It’s full-bodied, refined at the top end and decently weighty in the bass. There’s a pleasing amount of grip at low frequencies and the kind of definition that rivals some of the better transistor-based alternatives. It’s at home with Kendrick Lamar’s King Kunta, pounding out the bass with conviction. There’s plenty of attack and drive, even if rhythmically it sounds more surefooted than enthusiastic. The important thing is that the ‘feel’ of the music comes through intact. Lamar’s attitude-packed delivery is clear and wonderfully articulate. There’s an impressive degree of subtlety through the midrange, particularly in the way low-level dynamics are portrayed. This is a quality that works equally well with the folk-tinged output of The Unthanks as it does with Lamar’s hip-hop. The built-in phonostage is pretty good too. It’s got a gain of 44dB, which is enough for most moving-magnet cartridges and high output moving-coil designs. We’re pleased with the low level of noise and hiss, and it retains much of the robust but refined balance of the line stages. Some of the transparency and resolution is reduced though, so if vinyl performance is a priority, a dedicated outboard unit would serve you better. We’re less taken with the headphone output. There’s plenty of power on tap, so the Cronus should be able to drive most price-appropriate headphones with ease. But comparted to the natural warmth and body of the speaker outputs, it lacks a little expression and doesn’t draw us into the music as well. But we don’t think that’s enough to dent the Rogue’s case. Most rivals don’t even offer a headphone output, so we can’t knock it down for having one that falls just below the extremely high standards the amp sets in other areas. 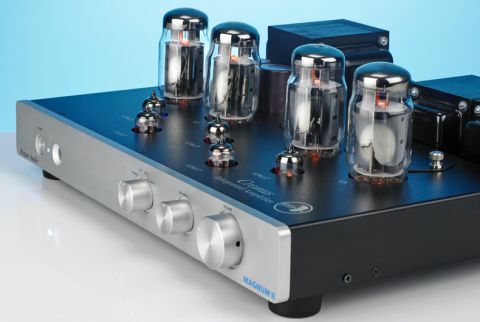 The Cronus Magnum II is more than just a good, sensibly priced valve amplifier. We think it’s a great amp for the money regardless of technology used, and a viable rival for established class leaders such as Naim’s SuperNait 2. That makes it a fine buy indeed.